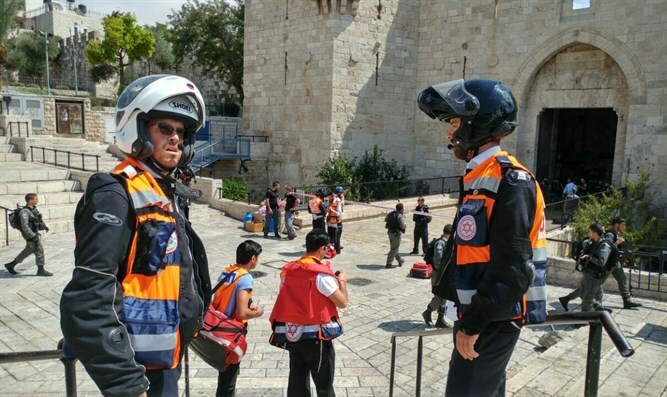 An Arab terrorist tried to commit a stabbing attack at the Damascus Gate of the Old City of Jerusalem. He was killed by police. An Arab terrorist tried today, Friday, to commit a stabbing attack at the Damascus Gate of the Old City of Jerusalem, but was neutralized by police. From the police investigation, it appears that the terrorist, a Jordanian resident in his twenties, arrived near the Damascus Gate, where he noticed border police. He advanced towards them quickly, knives in his hands. The fighters saw the terrorist as he approached and shot, killing him. Searches revealed a third knife in the terrorist's possession, in addition to the two he held in his hands.